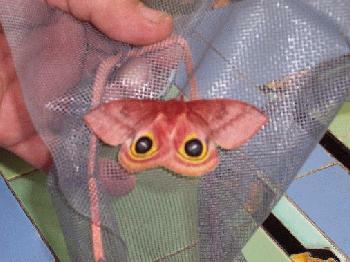 The io moth adult is 2.0 to 3.5 inches (50 to 87 mm) in wingspan and easily recognized by the large eye-spots of the hindwings. Adult males are mostly yellow, while females have brown forewings. Subspecies A. io lilith (Strecker) of Florida has male adults with distinctly red-brown forewings, especially in south Florida; the same type of red form is also found in southern Mexico and the Bahamas. The larvae have characteristic long yellow or green spines covering most of the body. Only a few other caterpillars may look similar, but these do not have the well-defined red and white lateral line. The io moth caterpillar has at least three discrete color forms: the usual last instar form is light green, with a distinct lateral body strip of red and white. Earlier instars are yellow overall and the lateral line is reduced. There also is a blue-green color form of last instars (Collins and Weast 1961).